Ebac - CD85 : Dehumidifier Review • The Air Geeks, reviews of air conditioners, dehumidifiers and air purifiers. 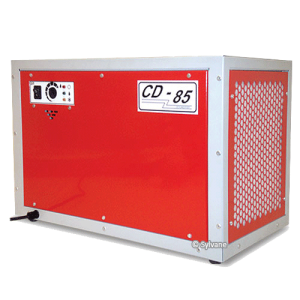 The Ebac CD85 is a rugged dehumidifier that offers an impressive dehumidification capacity of 56 pints per day. It features a high-capacity pump that is capable of pumping the condensate to a sink that is up to 10 feet above it. This dehumidifier comes with a 10 feet long drainage hose. To enable users to enjoy a truly comfortable environment, this unit features a humidistat. This subsystem enables you to adjust the humidity of your room to your desired level. Have you been struggling to control the relative humidity of your room and you are looking for a suitable dehumidifier? In case you have already identified the Ebac CD85 and you are looking for reliable and unbiased information about its features and performance, then you have come to the right place. We have thoroughly researched to provide you with reliable information that will help you to make a well informed decision. Without further ado, we will start with its description. We will then explore its pros and cons, and give you our Air Geeks reco! The Ebac CD85 is an energy efficient dehumidifier that is suitable for a wide range of industrial and commercial applications. This unit is ideal for laboratories, apartments, restaurants, locker rooms, telecommunication rooms, basements, offices, museums and so on. In addition, its configurable outlet and inlet positions allow users to position it in a room with little or no challenges. The high capacity pump of the CD85 is capable of pumping the condensate to a sink that is several feet above it. For high humidity places, a high performance dehumidifier is required to ensure that the relative humidity is maintained within the desired level. In industrial set-ups, excess humidity can cause corrosion. Excess humidity can also damage furniture and other priceless possessions in homes, hotels, offices and so on. This dehumidifier is capable of pulling up to 56 pints of moisture from the air per day. Furthermore, it delivers high efficiency. Its rotary compressor delivers optimum performance while consuming minimum power. Does the Ebac CD85 Dehumidifier allow users to adjust the relative humidity of their spaces to their desired levels? Yes, this dehumidifier features a humidistat that enables you to set the desired relative humidity level. This adjustability makes it a suitable choice for industrial and commercial uses. To prevent build-up of frost, this dehumidifier offers a defrosting feature. This “hot gas”feature helps to melt away any accumulating frost. 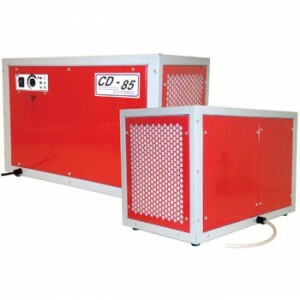 In case you are looking for a durable dehumidifier, then you need to consider the Ebac CD85. This unit is strongly built. Its chassis and housing are designed with epoxy powder-coated steel. In addition, its design allows simplicity of installation. The unit also features an extra-long power cable. Are you looking for a unit that you can operate with ease? The CD85 is an easy-to-use appliance that offers user-friendly controls. Furthermore, this dehumidifier has rubber anti-vibration feet to minimize vibrational noise. Highly durable. This unit is strongly designed and can run for many years without breaking or needing repairs. This is a big plus for us, “buy it for a lifetime”! Effective dehumidification. 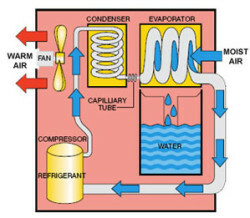 This unit pulls moisture at an impressive rate to achieve the desired relative humidity level. i. Produces a loud sound. Just like most appliances that have a compressor and a pump, this unit produces noise. It may therefore be an unsuitable solution for quite places such as offices and bedrooms. Weak condensate pump. Although most dehumidifiers lack this feature, we have noted that the pump in this unit is relatively weak. It is only suitable when the distances involved are short. This thing is a beast of a dehumidifier. I didn’t want a cheap hunk of “Made in China” junk for my crawlspace, and since most of the ones in the big box stores are made by one company, Gree, and they just had a huge recall (2mil+ units), I felt safer picking a much pricier but much better built machine. Plus, I figure the UK should know what they are doing with humidity being surrounded by water and all. My crawlspace is 3800ish cubic feet and was at 99% humidity when I installed this. I watched my humidity drop using AcuRite Digital Wireless Thermometer with Humidity and Daily High/Low 00611A1. Between two and three weeks later, it was 42% and steady. I didn’t like the flat head screws holding all the plates on, so I changed them to Phillips. They’re just easier to remove. I think there are around 22 or so and they have plastic washers to protect the metal panels, screwed into plastic, easily replaceable sockets. I removed all the panels as the manual recommended and inspected everything. I found a random hex head bolt just rolling around inside, but none were missing. The plug is quite long, as is the tubing. Note that the picture is incorrect (at least for unit), the plug and tubing are on the same side opposite the filter. I would prefer the dial to tell me what level of humidity it will turn on/off at, but unfortunately it does not and it’s just an increasing in thickness semi circle broken up. In case you are looking for a highly effective dehumidifier, then you need to consider this unit. It is strongly built to offer you service for years. Unlike most dehumidifiers, this system features a condensate pump that makes it suitable for basements and other places where the condensate cannot flow under gravity. With this unit in your office, factory, store, or restaurant, you will not need to empty the bucket manually and it will last a long time. For the Air Geeks, it’s a buy! Despite the good features offered by this unit, we have observed that its pump is weak. We have also noted that it produces noise and it is therefore unsuitable for quite places. In case these cons are not a bother to you, then you can proceed and purchase this unit for your dehumidification needs.